According to a whitehouse website (whitehouse.gov/refi), The President is preparing a plan to help many individuals qualify to refinance their home, who under current rules cannot do so due to the decrease in their home value. So they created a website that is supposed to help us with that. It really is a simple widget that should not fail us right? We answer a few questions and figure out if we will qualify under this proposed plan. 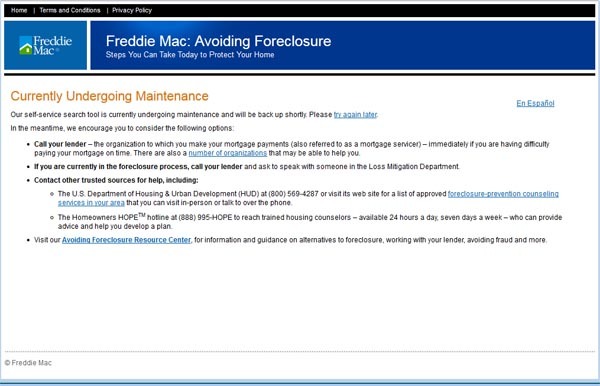 Well guess what happens when we get to the question about Freddie Mac? So much for being helpful for those who need it. So much for any sense of urgency to fix the site. When Facebook, Twitter and most other websites go down, the world is in outrage and Zuckerberg’s staff work round the clock to get it fixed. And usually within 5 minutes all technical problems are fixed. Not with Freddie Mac though. This is an editorial piece.